Apartment 3 is on the second floor has recently been extended into the loft to accommodate 4-6 people. Accommodation on the second floor is comprised of an entrance hall, living room, bedroom and bathroom. The entrance hall provides space for hanging coats and storage. The large, open plan living room has a kitchen at one end and an original feature fireplace (decorative only) at the other. The living room has a table and chairs and a comfortable double sofa bed. The room has lovely sea views from both windows. The new fitted kitchen is well equipped and has an electric oven and hob, fridge freezer and microwave. The room has a large TV with free view and a DVD player. There is further storage and hanging space for clothes in the lobby between the lounge and the bathroom. The bedroom has a king sized bed and dressing table The bathroom has a bath with an integrated shower, WC, hand basin and a large heated towel rail. Please note that as the bath is against eaves wall and there is not full standing height (see photo). The shower therefore, is only for limited use. The newly converted upper area provides an additional bedroom with a double bed, as well as an adjoining WC with hand basin and a large heated towel rail. 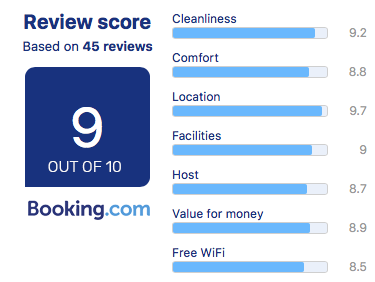 We've had hundreds of happy visitors, read some of the many reviews from Booking.com below!